Hebrew Instruction, curriculum, books, games, and more. I started writing Hebrew from the Very Beginning partly because I kept hearing fellow Hebrew enthusiasts asking, "What's the best way to learn Hebrew?" and partly because of my own struggles to find good, inexpensive Hebrew instruction. It seemed to me that all of the Hebrew courses that I had seen previously either did not cover a lot of important aspects of the language, or started at a level that was too advanced. Making a Hebrew course that really starts from the beginning has been on my mind for quite a while. My hope is that this course will help you easily get a good grasp of the basics of the Hebrew language. I tried to design this course to work for someone who knows absolutely no Hebrew when they pick up the book. I wanted to make it very informative, but also enjoyable and simple. 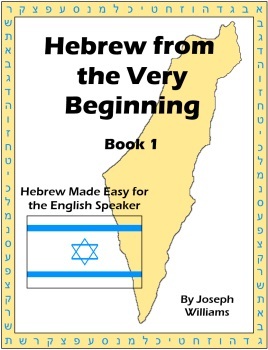 I hope you find this course to be useful in your quest to learn the Hebrew language. What's the difference between Modern and Biblical Hebrew? What's the best way to learn Hebrew?